Can this paired-down version of the P55 really compete? The Gigabyte P55-UD3 is more like it. Recently, we've seen the high end of the burgeoning P55 spectrum; mobos lurking dangerously close to the £200 mark and all more expensive than a host of existing, bandwidth-heavy X58 boards. Still, performance with a likewise top-end Lynnfield CPU onboard was excellent and had us drooling over the possibility of the more bargainous mainstream boards to come. Here's the first. Granted, if you spend £100 on a P55, £220-odd for the 2.8GHz Core i7-860, plus the probable expense of forking out for a DDR3 kit, it still adds up to between £350 and £400 for the set. That's not exactly cheap, sitting pretty close to the cost of setting up a cheap X58 and Core i7-920 D0 system. But at close to half the price of the UD6, this latest board is still a belter. We managed to garner performance that was an atom's fart away from more expensive P55s. With the same components (RAM and CPU), we managed to get an impressive overclock without any of that unpleasant voltage tweaking too. Even when paired with a cheaper RAM kit, there was precious little to choose between the two in the overclocking bracket. 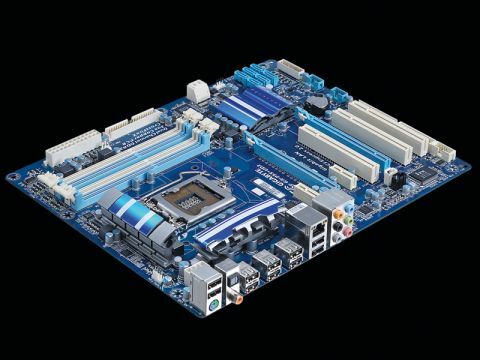 In fact, so much has moved onto the die that possibly all you're paying for on the pricier mobos is a few pretty LEDs and some fancy features, rather than extra performance. That's only when you're talking about overclocking prowess, though. On this lower-end board, the much-vaunted Turbo mode refused to make an appearance in multi-threaded apps. In single-threaded programs it offered us an extra 400MHz, but that dropped to absolutely nothing when we loaded up four cores. The mainstream user hoping to take advantage of this oft-talked about feature of the Lynnfield chips is going to be sorely disappointed then. That said, although we didn't manage to squeeze our 2.93GHz chip over the 4GHz mark on the UD3, we came within 100MHz of it through some BIOS tweakery. So, strangely the cheaper board isn't really one for the user who doesn't want to get their hands dirty in the BIOS. If you want the dynamic overclocking loveliness that Lynnfield offers, you're going to have to go for one of the pricier motherboards. If, however, you're prepared to have a dig about with base clocks and multipliers, you can still get this cheaper board flying without voltage tweaking. But we still have to take issue with the price. Although Gigabyte's UD3 is nearly £100 cheaper than its top-of-the-line board, it still seems a trifle expensive to us – especially in the absence of expensive plug-in features, such as power over eSATA, 24-phase power, Dolby surround and SLI support. This is a far more stripped down chipset than we've seen from Intel before and with so much moving on-die, it shouldn't cost as much to manufacture. What we're paying for at the moment then is Intel and Gigabyte's research and development costs, so there's definitely a case for waiting those extra couple of months and watching the prices on these, admittedly excellent, boards drop pre-Christmas before you splurge on one.